Eric Shell, Principal with Stroudwater Associates, worked with TGH in 2014, through the Rural Hospital Performance Improvement (RHPI) project, on a Financial Operational Assessment (FOA). Center staff spoke with Jim Blackwood, Administrator of TGH in January of this year concerning their progress. Q: What are some of your hospital's successes regarding implementation of Eric’s recommendations? A: More than half of the recommendations have already been implemented. One very big item was to come up with a better quality dashboard. While data was being collected in the past, the findings weren’t always actionable. Now action items are created in response to the numbers. The scores are immediately discussed at director meetings and the team “drills down on dips.” For example, a dip was seen in the HCAHPS score on “quietness of the hospital,” so the directors started exploring what happened. They found that staff at shift change were walking through the hall of the unit. Foot traffic was immediately rerouted and scores went back up. The team is proud to have created a scorecard based on MBQIP and other measures. There is a separate dashboard on HCAHPS and data is collected monthly. HCAHPS scores are then used to create posters that are put in hallways of the hospital and are reported to the board, medical staff, and other leadership groups. This has resulted in very positive HCAHPS measures that are above the state and federal level. 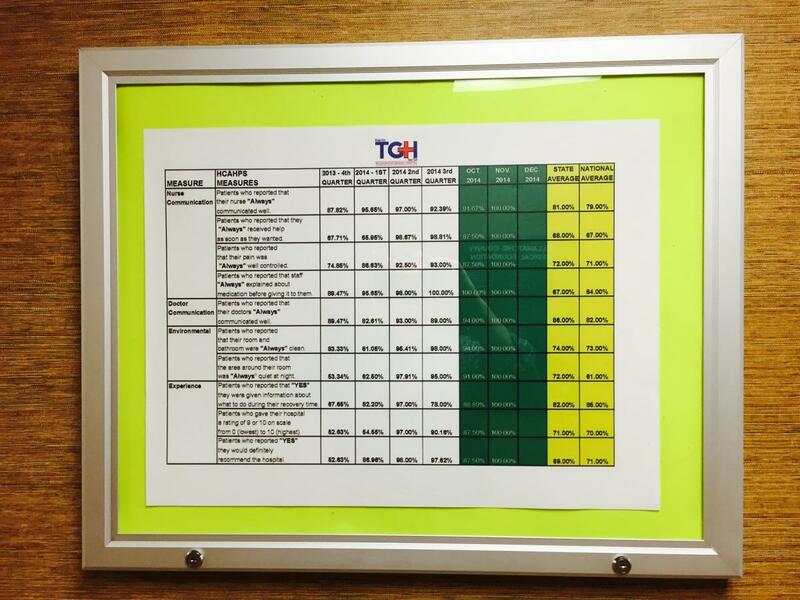 In addition, TGH has hit 100% compliance in quarterly MBQIP numbers. They are also proactively looking to focus on quality numbers for Nursing Home Compare. TGH has focused on increasing service lines offered in the community. They recently recruited another primary care physician. In addition, they are completing a contract to bring in cardiology and OB/GYN services one day per week in RHC. TGH has been in the process of building a new wellness center, which will house their therapy services. The space will also provide room for future expansion into cardiology and pulmonology rehabilitation. The hospital found they also needed staff with more emergency-specific skill set in evenings. They now have nursing staff with that specific expertise to help in the emergency department. This is incredibly valuable when true emergency issues do come in. As part of this project, TGH has focused on developing leadership abilities, especially regarding handling the “business” end of their departments. On a monthly basis, there is much more awareness for departments of revenue, inventory, and supplies and they look at the report of direct costs. Q: What are the expected next steps towards adopting your consultants' recommendations? Is there a sustainability plan? A: We will continue to use quality metrics to assist us in planning improvements. We will also continue to add specialty areas that meet the needs of our community and maximize opportunities under the 340B program. Q: What were the expected outcomes of this project? Has your hospital been able to document any of these outcomes? A: The hospital is tracking patient revenue, total margin, and days cash on hand as the measurable outcomes from this project. FY14 totals showed significant improvements in all three areas but it is too early to determine for the FY15 data. Q: Aside from the measurable outcomes, what has been the impact of this project on your community? Q: How do you believe this project has helped you move forward in the newly emerging system of health care delivery and payment? A: We are putting pieces in place now to posture ourselves for changes in the reimbursement model. If payments are tied to quality, then obviously that’s where we want to be. Incidentally, it’s also the right thing to do. Engage board, staff and community to support the development and implementation of strategies that high-performing hospitals utilize to deliver patient-centered care. Evidenced-based tools and best practice resources to help providers to improve quality of care and patient satisfaction.